Make Me Yours: A Stand-Alone Single Dad Romance. Dylan Allen is truly an unstoppable and creative genius. The Legend is a flawlessly written masterpiece. The storyline flows effortlessly and everything about this book is still lingering in my mind in such a wonderful way. I was sucked into Remi and Kal’s beautiful love story and I devoured it within hours. Remi invaded my mind, heart and soul. I was intrigued by him in The Legacy and I was beyond thrilled as he turned out to be so much more in this book. Kal’s character was cleverly written, she’s admirable and exudes strength and courage. It was impossible not to feel an immediate connection with these two and their chemistry was off the charts. The Legend’s plot is emotionally charged, filled with angst and is climatic in more ways than one. I endured a whirlwind of emotions while reading this book. Remi and Kal complimented each other well as their romance was intense, passionate and intoxicating. They made my heart flutter with their flirty behavior and romantic gestures. And the magic they created between the sheets was wild and scorching!! Another compliment to this book is the shocking plot twists!! It took a few minutes for me to pick my jaw off the ground after reading them. I definitely couldn’t have predicted those secret revelations. This book is without a doubt one of my top favorite books that I’ve read so far this year. 5.0 out of 5 starsI’m A Remi Person!!! Epic Love...they had it in spades!!! Remi’s story was a roller coaster of emotions...a ride I never wanted to end! The first time they met bonded them for life. Timing just never seemed to be on their side. They both had to live through their own hell to finally get the love that they both deserved...together! Remington Wilde was bred to lead his family. To run the family business and be legendary in their town. However, Remi had plans of his own! Kal had her own dreams but getting there was going to be a struggle. She came from meager beginnings and a struggling single mother whose solution was to find a wealthy man. Two kids who made a lasting impact on one another. They would be in and out of each other’s lives for the next twenty years. This story definitely tore me apart and broke my heart...more than once! But it also made Kal & Remi’s love and their union that much sweeter! This love story spanned decades and began to develop when they were in middle school. It started as two people who bonded because of their lackluster home life. A love that flourished when they were reunited in high school. Then torn apart by lies and deceit, their path was forever changed. But a love like their’s, always finds a way back. Book three cannot come soon enough. Rivers Wilde is one of my favorite places to visit. 5.0 out of 5 starsAbsolutely A-MAZ-ING!!! Oh this book!!!! It's stunning and amazing and I can't stop thinking about it!! Days later and I still have all of the feels!! Dylan Allen has this way of taking a story and spinning and twisting it with angst, intrigue and romance. She did this so perfectly with Remi and Kal. Remi is the Wilde heir. Raised to be a legend, like his father. Kal is from the other side of the tracks living with the mistakes her mom has made. They were perfect for each other. Unfortunately his family didn't think so. So many lies and so much manipulation but oh what a HEA!! I finished this book and all I could say was wow, just wow. Is the second book in the Rivers Wilde series. It can be read as a stand-alone. But to really enjoy the story and have a better love for the characters. I recommend you read Legacy first. Holy wow this was a beautiful story. Oh my god Remi. From the first start I fell for him and was rooting for him from the beginning. Kal you want her to get back to her Remi. Yes there is going to moments you want to smack one of the characters. Mostly the mothers of both the main characters. I loved Hayes in the first book but Remi capture my heart took his place. In order to know more you have to take the chance and read the series and devour the story. The Legend is rightfully name because you need to get to know Remington Wilde the Legend. 5.0 out of 5 starsHold on to the edge of you seat for this one! Dylan Allen did an amazing job building this fast moving, complicated tale that spans decades filled with twist, turns and manipulation. It will grab you from page one and hold you hostage until the last. The need to know how this well tangled web of deceit and lies will all unfold was all encompassing! 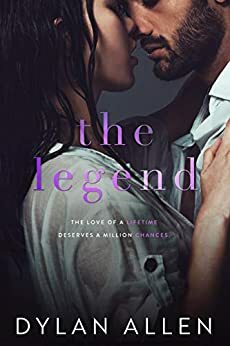 You will easily fall in love with Remi and Kal and find yourself rooting for them to find their way to their happily ever after no matter the obstacles thrown at them, and there were many!